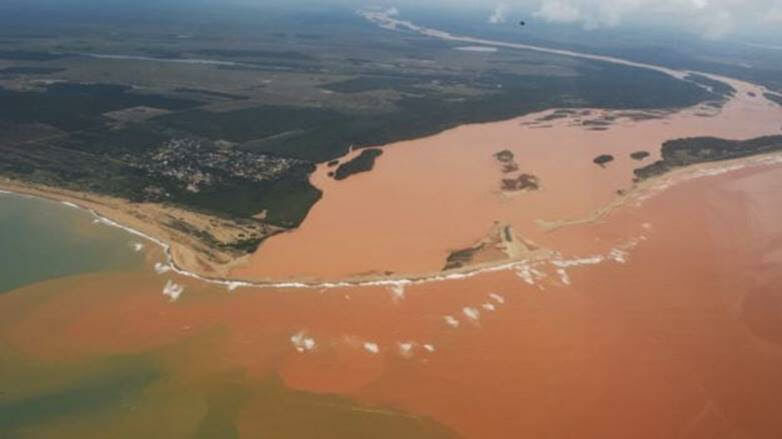 “ALL tailings ‘ponds’ are a problem. 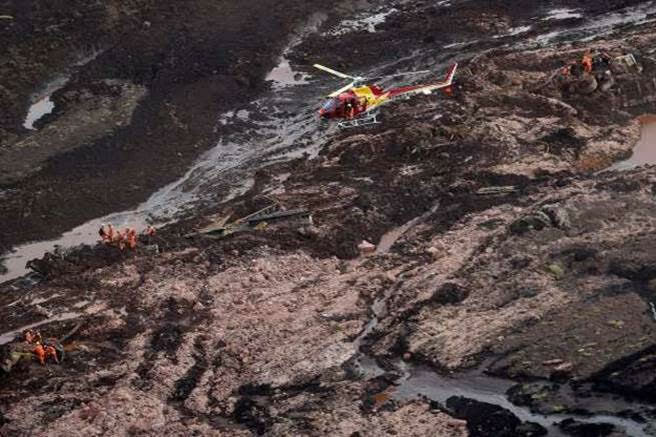 If they don’t breach and spill massive amounts of toxic sludge into the environment like at Mount Polley, they leach that contamination slowly, poisoning the waters and lands (and aquifers) around them for centuries.” – Quote from: http://canadians.org/blog/update-mount-polley-mine-disaster-imperial-metals-and-government-focus-covering-instead. 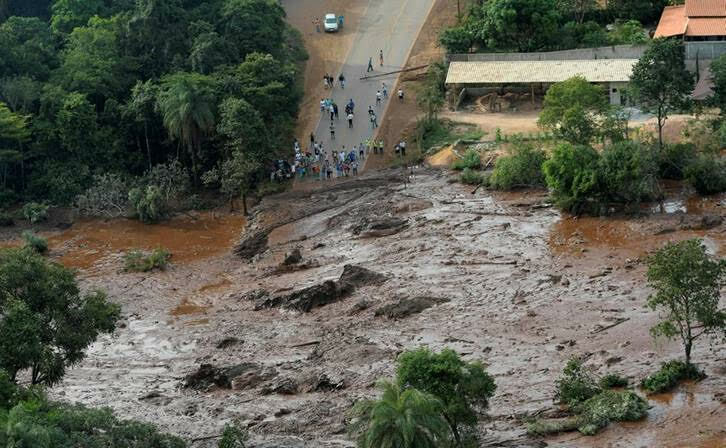 27 Jan 2019 – The two most recent Brazilian open-pit mine “accidents” that will be discussed in this extended-length Duty to Warn column, will probably require close to a trillion dollar death and disability benefits for just the following two categories: 1) the hundreds of dead and wounded miners (and their grieving families); and 2) the massive amounts of property damaged that was owned by the thousands of government and private owners whose roads, bridges, homes, land, lives and health that were destroyed or damaged after the deluge – all the way to the coast. Carefully study the photos below and visualize the St Louis River. pollute the drinkable, fishable and swimmable waters of Lake Superior so that our progeny will not understand what the great lake once meant to the Northland’s ecosystem? 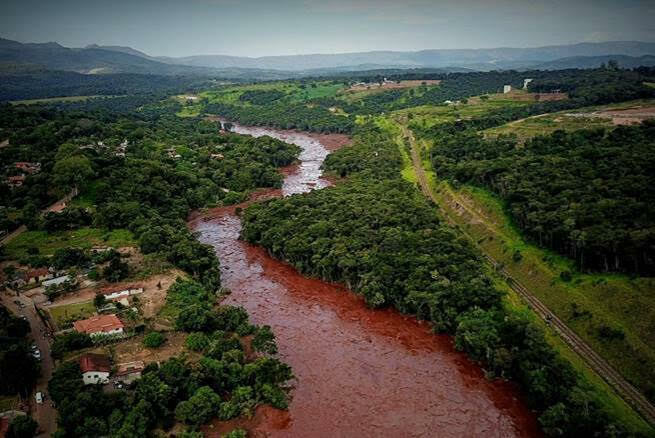 The mine waste-contaminated mouth of Brazil’s Rio Doce, once a healthy fishery, as it enters the Atlantic Ocean (which remains contaminated after 3 years). 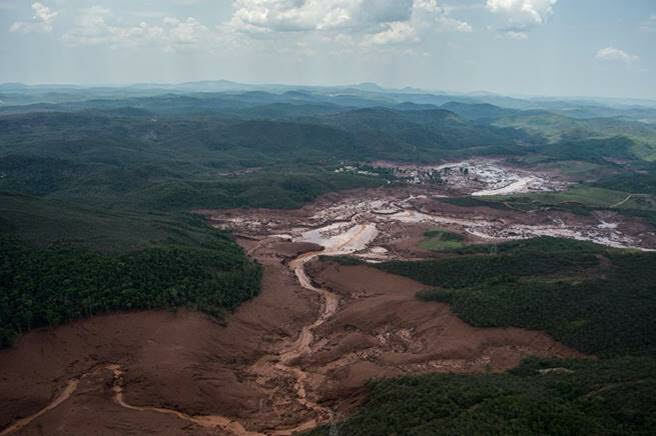 (This is what could happen to Lake Superior if the earthen wall of PolyMet’s tailings lagoon suddenly liquifies, over-tops and collapses). 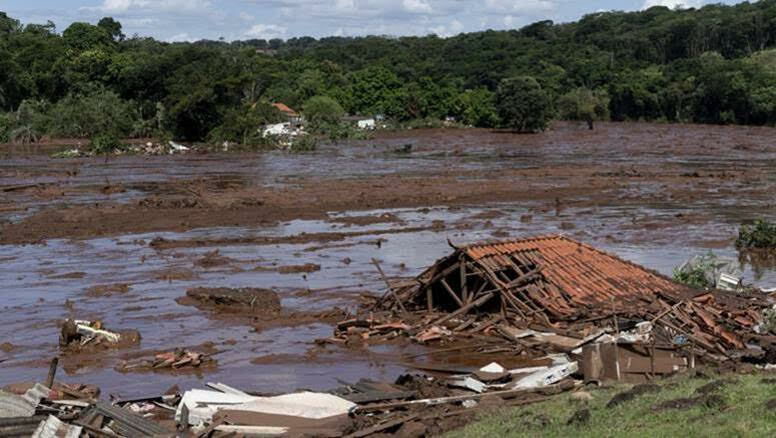 A demolished home lies in ruins after a dam collapsed near Brumadinho, Brazil the day after the dam failure. What’s left of the Vale mining company’s administrative buildings, a processing plant and assorted missing company buildings, including the company cafeteria and the barracks where hundreds of miners had been housed. 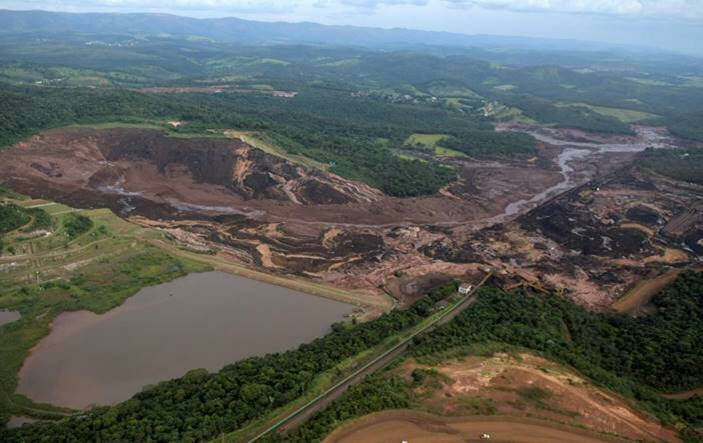 Emptied-out tailings lagoon (upper left), a still-intact, water/sludge-filled tailings lagoon (lower left) – and the downstream destruction represented in the entire upper half of the photo. 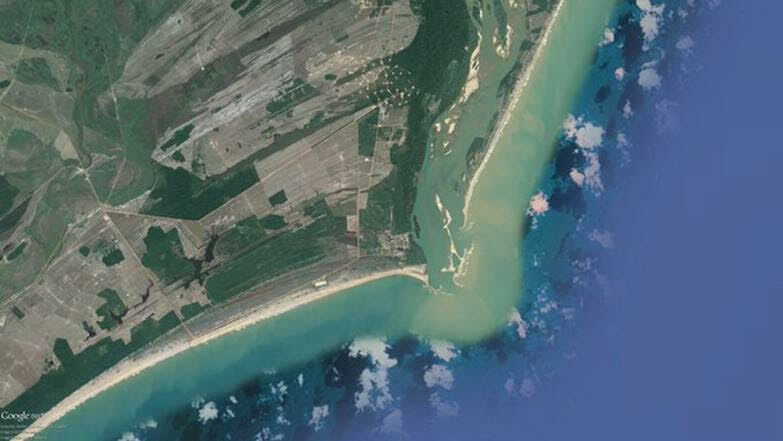 View of toxic sludge in a large river – showing a tributary to the right where the sludge presumably moved upstream momentarily against the flow (note the fresh blue water – right upper corner of photo). 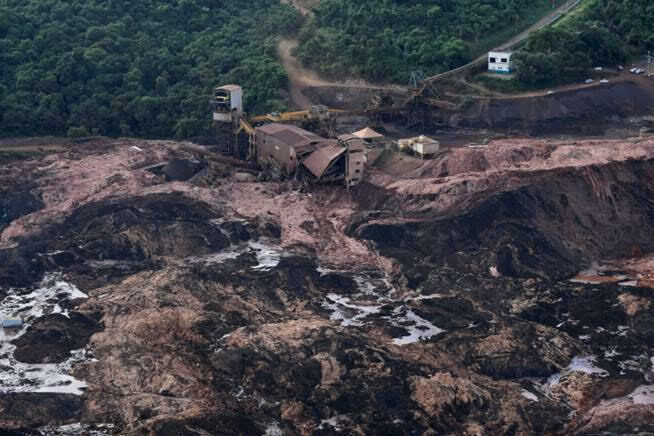 An aerial view shows a destroyed bridge after a dam collapsed in Brumadinho, Brazil. 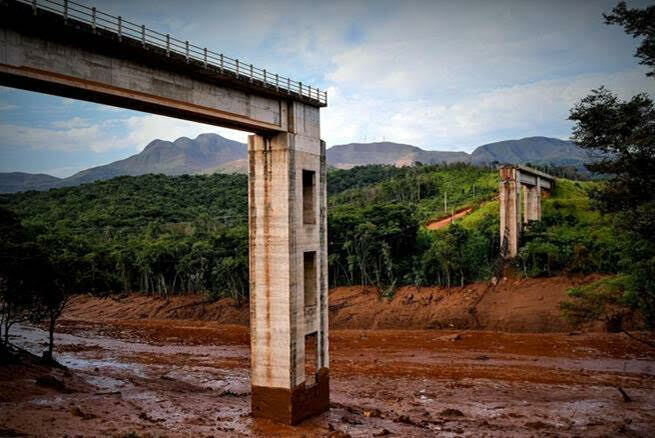 No signs of any of the remains of this dam, signifying the power of the deluge. 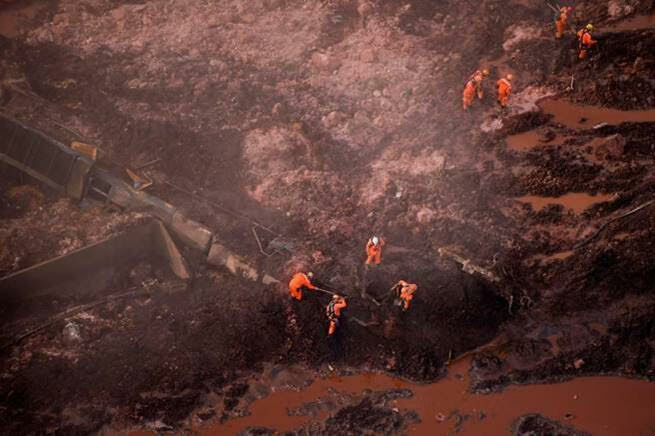 Rescue workers vainly searching for bodies. 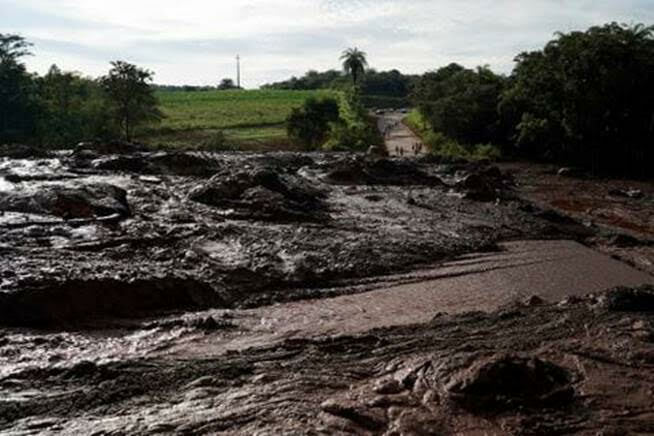 Totally washed-out highway that may have once crossed a small river. 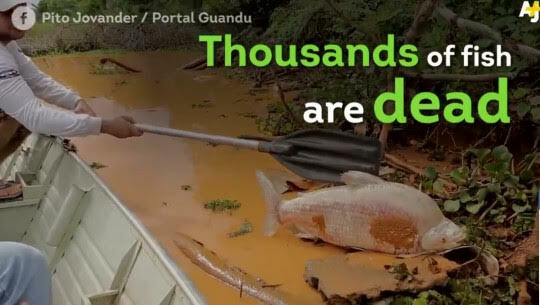 Sludge has obliterated a highway – and much more. Searching for bodies downstream from the mine tailings pond breach. 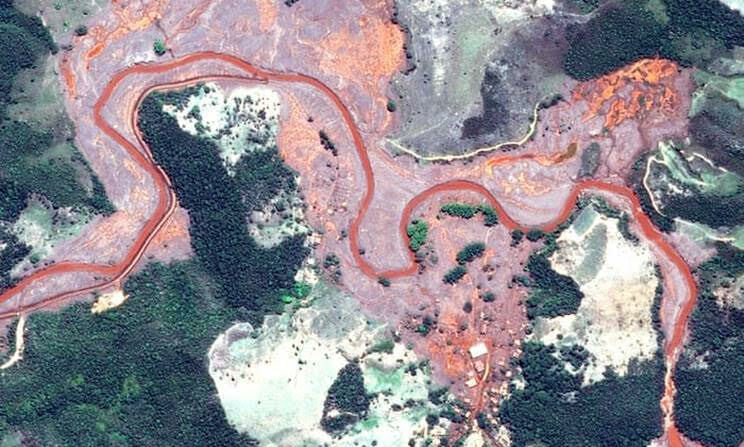 Satellite image from 12 November 2015, one week after the Samarco mine disaster. 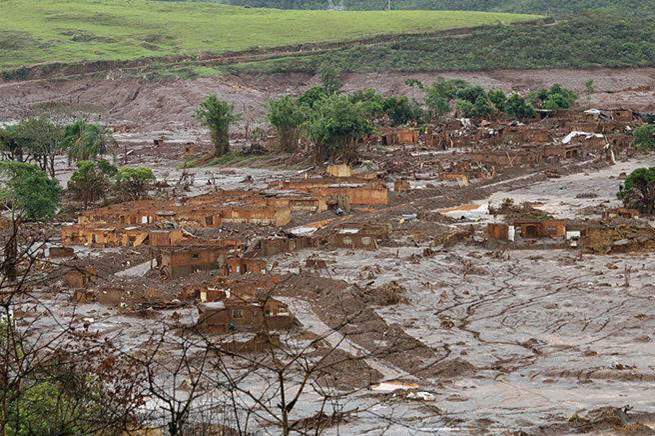 Part of a destroyed village that was downstream from Brazil’s Samarco Mine in 2015e site. 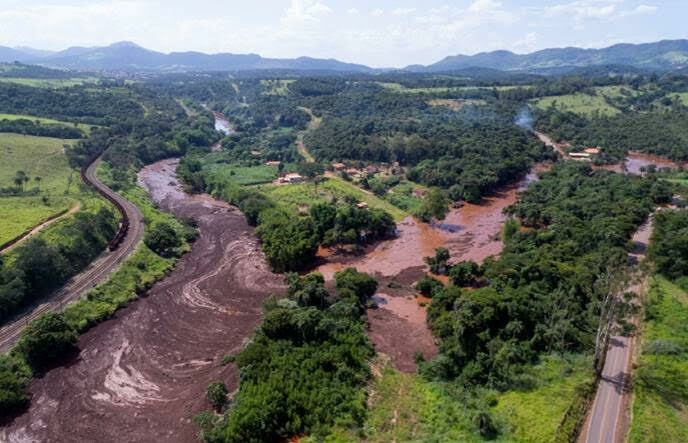 Contaminated river in Brazil, 2015 (presumably the Rio Doce) – note the large number of floating uprooted logs from the upstream tailings dam breach. A massive ravine where a small stream once flowed. 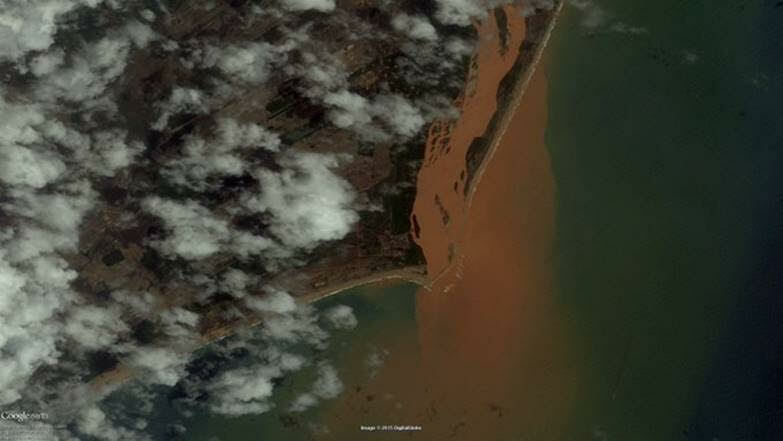 Before and after satellite photos of the Atlantic Ocean showing toxic sludge from the Samarco dam collapse near the port of Regência – DigitalGlobe/Google. 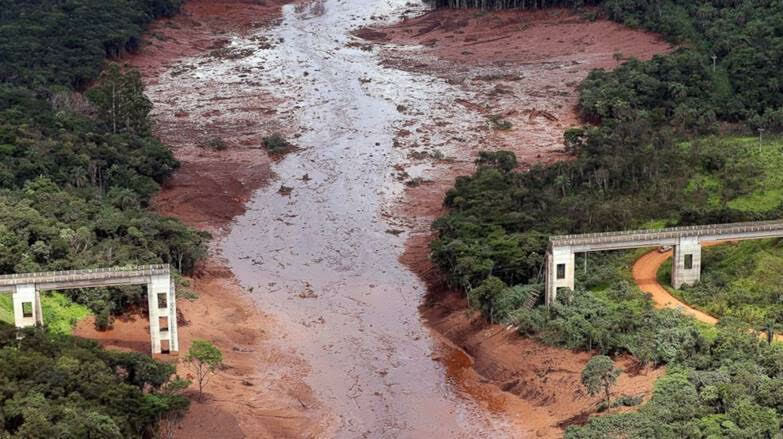 Anticopyright: Editorials and articles originated on TMS may be freely reprinted, disseminated, translated and used as background material, provided an acknowledgement and link to the source, TMS: 300 Miners Feared Drowned after a PolyMet-style Tailings Dam Ruptures in Brazil, is included. Thank you.